Eric Boelkens, woodworking instructor at Horner Park, shows off a wood robot made by one of his beginner students. Children and adults alike learn or hone their woodworking skills through programming at Horner Park, one of 15 woodshops managed by the Chicago Park District. 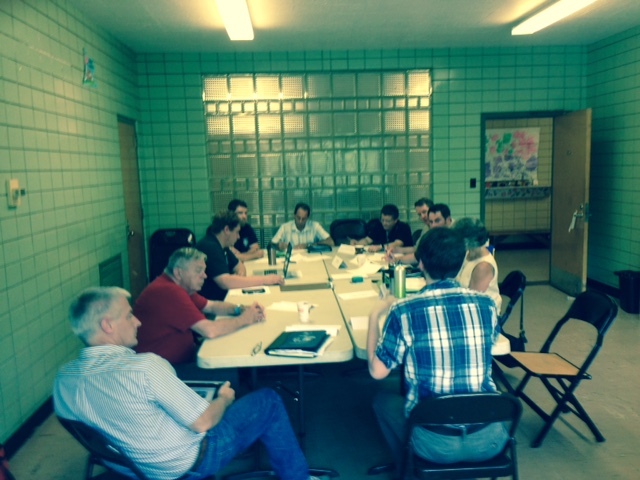 Horner Park hosted the September meeting of the Illinois Wood Utilization Team (WUT), which is hammering out details for an urban wood conference to be held in March 2016. 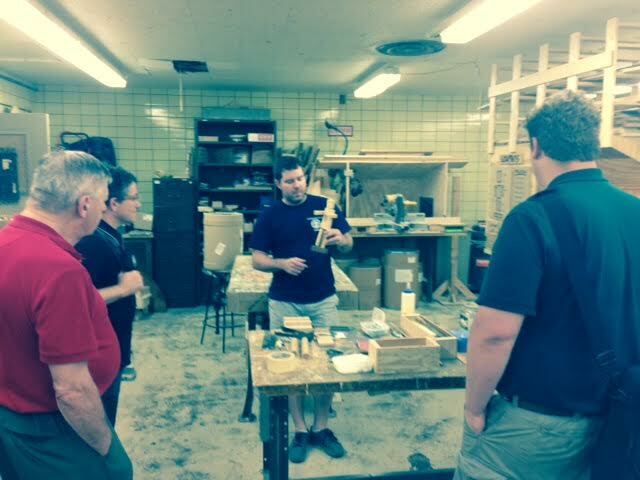 Eric Boelkens, woodshop instructor, led WUT members on a meeting-adjourned tour of the Horner Park basement woodshop. The shop includes standard introductory woodworking equipment: band saw, table saw and jig saw. Boelkens said he teaches woodworking to children as young as 7 years old as part of the very popular Family Woodshop class. Youth programs for boys and girls aged 9 to 12 make up the “core” of the program, he said, with adults-only classes also available. Participants, including woodworking novices, are taught essential woodworking skills including measuring, designing, cutting and sanding. Projects range from birdhouses and small cabinets to bookcases depending on age and skill levels. Members of the Illinois Wood Utilization Team discuss the March 2016 urban wood conference during its September meeting at Horner Park. In many of the classes, participants are making products from urban wood salvaged from trees removed from park district land. Talk about getting a hands-on education on the value of giving wood a second life! Youth classes start at a very affordable $16 ($32 for non-Chicago residents) for a 12-week program and only $40 ($80 for non-residents) for adult classes. Horner Park is located at 2741 W. Montrose Ave. in Chicago. Learn more about woodcraft programs, class schedules and registration. Find information about all 15 Chicago Park District woodshop facilities. Great value for furniture building.